Software Upgrade Guide◆ Notice 1. Check correctly the Full model name of TV Set. Ex) 42LB6900-TA : The Full model name must include national code.(ex. Do not unplug the TV power cord during software upgrading. 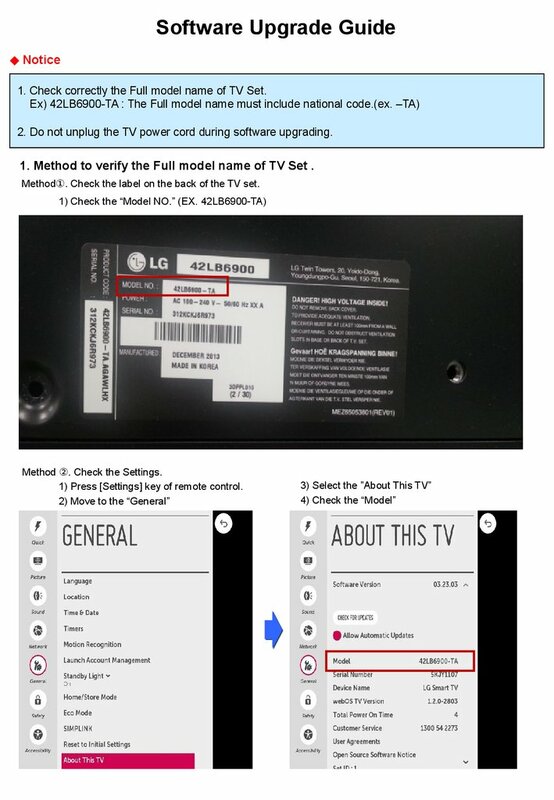 Method to verify the Full model name of TV Set . Check the label on the back of the TV set.① 1) Press [Settings] key of remote control. 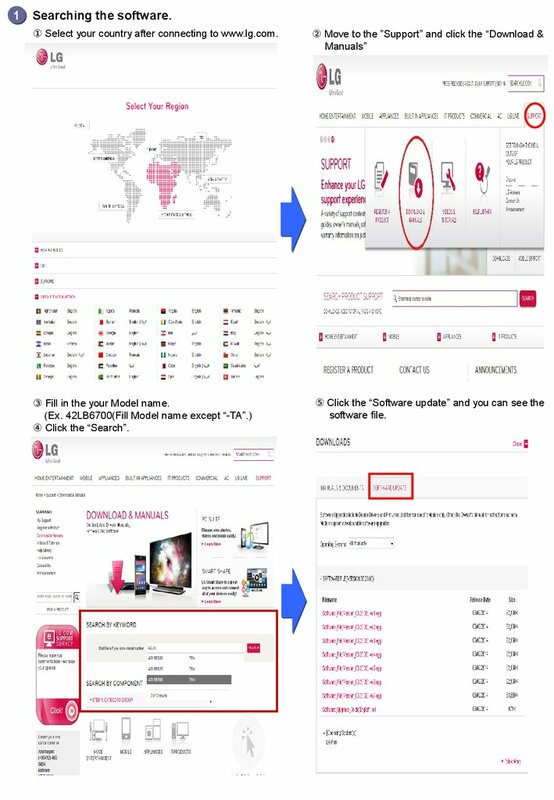 2) Move to the “General” 3) Select the ”About This TV” 4) Check the “Model” Method . Check the Settings.② 1) Check the “Model NO.” (EX. 42LB6900-TA)1 Searching the software.① Select your country after connecting to www.lg.com.② Move to the ”Support” and click the “Download & Manuals”③ Fill in the your Model name. 42LB6700(Fill Model name except “-TA”. )④ Click the “Search”.⑤ Click the “Software update” and you can see the software file.2 Downloading the software file to the USB Memory device. 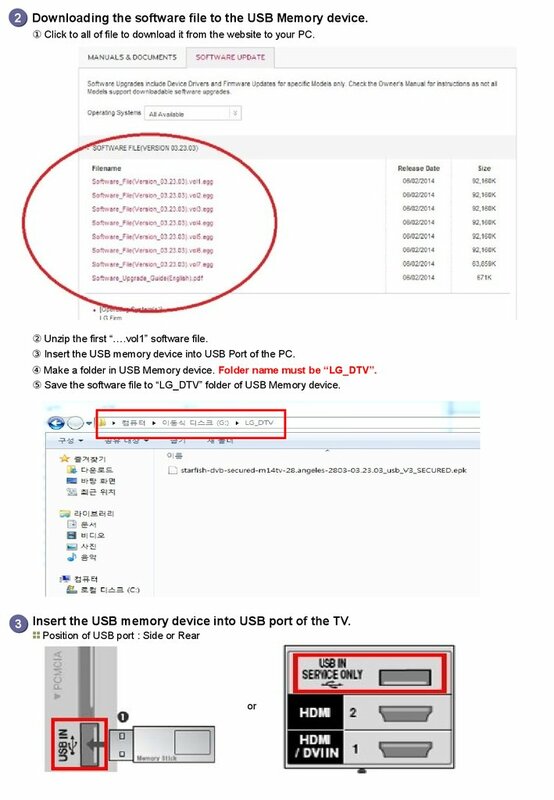 Insert the USB memory device into USB port of the TV.3 Position of USB port : Side or Rear① Click to all of file to download it from the website to your PC.② Unzip the first “….vol1” software file.③ Insert the USB memory device into USB Port of the PC.④ Make a folder in USB Memory device. Folder name must be “LG_DTV”.⑤ Save the software file to “LG_DTV” folder of USB Memory device.or② If below message will appear on TV, please select “INSTALL” 1) Copying the new version software file from USB Memory device to the TV system memory.※ Don’t remove the USB Memory device while this message is displayed. Do not unplug the TV power cord while this message is displayed. 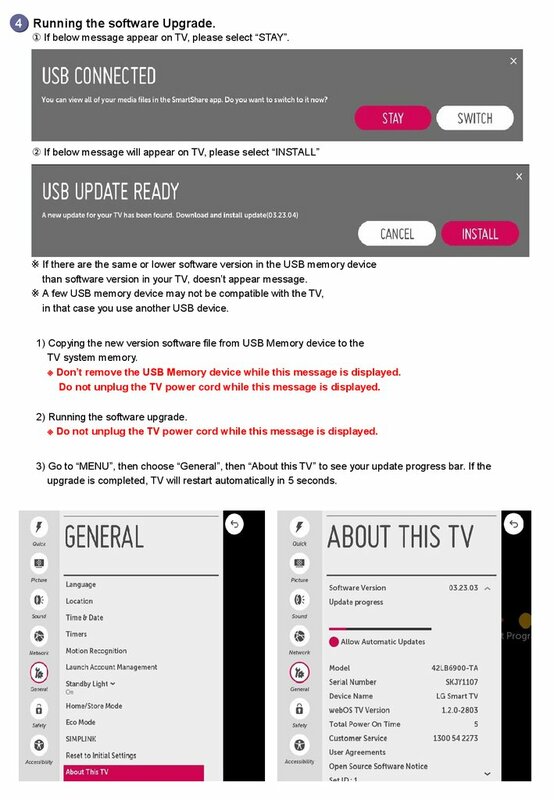 2) Running the software upgrade.※ Do not unplug the TV power cord while this message is displayed. 3) Go to “MENU”, then choose “General”, then “About this TV” to see your update progress bar.